Marcus Valerius Aquila has scarcely landed in Britannia when he has to run for his life - condemned to dishonorable death by power-crazed emperor Commodus. The plan is to take a new name, serve in an obscure regiment on Hadrian's Wall and lie low until he can hope for justice. Then a rebel army sweeps down from the wastes north of the Wall, and Marcus has to prove he's hard enough to lead a century in the front line of a brutal, violent war. Anthony Riches began his lifelong interest in war and soldiers when he first heard his father's stories about World War II. This led to a degree in Military Studies at Manchester University. 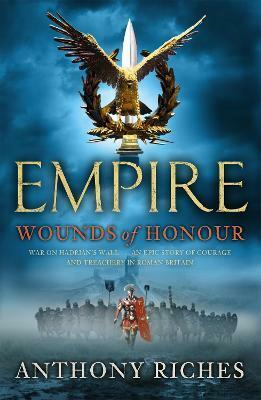 He began writing the story that would become Wounds of Honour after a visit to Housesteads Roman fort in 1996. He lives in Hertfordshire with his wife and three children.